market tasting menu and let him do his thing. classic Puttanesca sauce, and surrounded by mussels and clams. candy, one of my favorite things of the night. fruit and squash and the slight bitter edge of the sprouts. desserts are always spectacular but this was one of the best. wonderful dinner at Tallent, but oh, boy, do I wish you could. Oh boy, I wish I could go there for dinner, too! Those frites look amazing. Renee — absolutely. Let’s plan on it. The food seems to taste even better in the new place. Lydia — it’s worth the trip from wherever you are. The frites are truly amazing. Why is it so hard to get good fries these days? Oh, my! 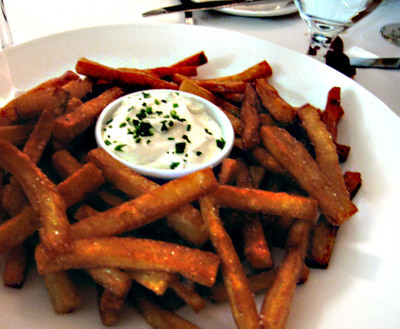 Frites with truffle-cream dipping sauce? Yum! I don’t reckon I’ll be heading to Indiana in the near future, but my mom goes there twice a year to hang out with some fellow female priests. I’ll forward this along to her– I know she’d love to try the Tallent’s food. Watching Dave Tallent’s talent through the window to the kitchen is like watching a painter at his easel. True artistry! Thank you Christi and Jerry for introducing us to Dave and Krissy and for your tutelage into the wonderful world of food. Sorry, I can’t say anything else because I have to go back and re-read that again (and wipe the drool from my chin). Don’t bother me, I’m busy! Lisa — your mom will love Tallent. If she wants other recs, have her email me. Ronnie and Ev — it’s been our pleasure. Kevin — don’t apologise. That’s kind of how I feel about it too.